Now available at Amazon in both paperback and Kindle and on this website in paperback! Order at the Shop to the right on this page and I will sign and send your copy! “Few people can tell a story like John Connelly, and many fewer have stories to tell like this one! On tax day 2016 — just after ice-out — John launched his canoe on a punishing 1,500-mile, 75-day paddling odyssey. The trip included the entire Northern Forest Canoe Trail, St. John River, Bay of Fundy, and Maine Island Trail. (Picture a lasso from upstate New York looping around the state of Maine.) Through his real-time tracking device, fans were able to follow his virtual rooster tail… and wonder anxiously every time the dot on the chart stopped moving, though it rarely stopped for long. “I first met John in Chilean Patagonia paddling the Rio Serrano river to explore icebergs and wilderness together for which I was his guide. With a characteristic understated modesty that seems to follow John both in person and his writing, he had put himself and his partner Nicole as ‘intermediate’ on our booking forms, although both were uttermost experts in their craft. We soon found a kinship amidst a shared passion of adventure, particularly that with a strong dose of type two fun. From a career of pioneering whitewater rafting and competitive paddling to a coffee magnate, seldom have I met such an inspirational couple as the Connellys. So when news of the PaddleQuest 1500 broke I followed with excitement, an ambitious goal which if anyone could achieve it would be John. By dictionary definition an expedition is ‘A journey undertaken by a group or person with a particular purpose, especially that of exploration, research or war.’ Covering 75 days, two countries, four states, 22 streams and 58 lakes the Paddle quest covered it all. Johns exploration was route, his research his own boundaries and his war with the elements. It is easy when writing an adventure book to focus on the ‘epics’ and of course for such an odyssey there are plenty to grip the reader to every page, but I find perhaps more special the attention John gives to the intricacies of daily expedition life. In a grand journey the quirks and quarrels of routine are the core reality of the experience and far harder to capture in writing. I found myself often drawn by the tale to my own experiences with a fond familiarity to what John was going through. Although I have never visited most of his route I felt like I was right there with him, cheering on his trail angels, willing his next stroke to pass the wind and snow and relaxing to the call of the loon. I really like books about real human powered journey’s and have read a lot of them. I have spent many an evening reading accounts of hiking the AT, the PCT; or paddling around New Zealand, Scotland, Ireland, etc., and sailing around the globe. It is safe to say that I have read literally hundreds of books of this type and I have a closet full to prove it. I believe that John’s story of his PaddleQuest 1500 trip has elements of some of the very best adventure writing. John’s personal warmth, humor, and humanity come through quite well and makes this a compelling read. John is the real deal when it comes to adventure and his preparation for this trip was world class. His accounts of the kindness of strangers (aka trail angels), reverent appreciation of good meals, the apparent random encounters with friends and supporters in remote locations are wonderful reminders of the joy and appreciation for the little things that can be so special about human powered journeys. I appreciate the opportunity to have shared a portion of his PaddleQuest trip. Prior to joining him for about 200 of the 1500 miles, John and I were acquainted through the Maine Island Trail Association and his lovely, heroically supportive wife Nicole. I really did not know John that well but signed on to join him for the portion of the trip through the Bay of Fundy and along the Bold Coast. Like so many things in life, this trip worked out because it was just plain supposed to. 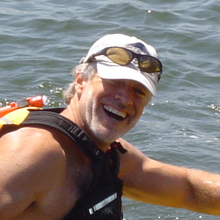 John’s arrival on the St. John River coincided with a weekend in Maine by some of John’s New Brunswick paddling buddies. They were kind enough to allow me to drop my car off in Machias and haul my boat, bod, and gear to a riverside motel in Fredericton NB where I would meet up with John. In hindsight, after 200 miles paddled mostly in about 8 days in the cold treacherous waters of the St. John River, the Bay of Fundy, and Bold Coast of Maine, I finally knew John and can’t think of anyone I would have rather shared this experience with. Despite the hardship and challenges, most evenings we laughed until our sides were splitting and gave thanks for the day. John maintained a cheerful, upbeat positive demeanor despite the most difficult circumstances because that is who he is. I am grateful for his friendship and highly recommend his written account of the trip. Is this book available wholesale? I’m an independent bookseller in Bangor, Maine. Though I have many customers that would be interested in the title, we don’t foresee ordering copies through Amazon. Thank you.